Maxwell Akanbi, MBBS, a PhD candidate in the Health Sciences Integrated PhD program, presented a lecture sponsored by the Institute for Public Health and Medicine. Mobile phone-based interventions and raising tobacco taxes may be cheap and effective ways to reduce smoking rates in sub-Saharan Africa, according to a recent seminar sponsored by the Institute for Public Health and Medicine (IPHAM). Countries in sub-Saharan Africa appear to be following the same model of smoking prevalence that gripped the West in the early 20th century: As a country becomes wealthier, smoking prevalence rises until mortality from lung cancer and other smoking-related illnesses catches up, triggering public health campaigns and an eventual decline in smoking. Sub-Saharan Africa is squarely in the build-up phase, with Cameroon as a prime example, according to Akanbi. In 2005, Cameroon’s smoking rate among men was just under 20 percent. Today, it’s ballooned to around 40 percent, a dramatic increase in smoking in a short amount of time. “This pattern is consistent in many countries in sub-Saharan Africa,” Akanbi said. The first step in reducing rates of smoking is to monitor and accurately assess the impact, but even that initial step is rife with complications, according to Akanbi. Many countries don’t have established ways to measure rates of smoking or cancer registries, so both rates of smoking and incidences of smoking-related illnesses are underreported. In addition, short life expectancy can mask the effects of smoking. “Life expectancy is between 50 and 60 years in many of these countries, so many people die before developing lung cancer,” Akanbi said. A ban on public smoking is another way to reduce smoking, but many governments are apprehensive about such a severe restriction, so few countries in sub-Saharan Africa have implemented them. A more popular method is to raise tobacco taxes, according to Akanbi. “It doesn’t hurt anybody, apart from the tobacco industry, and the excess revenue could be used to treat the effects of smoking,” Akanbi said. Another promising strategy is mobile phone-based smoking cessation interventions, in the form of daily or weekly text messages to recipients who’ve indicated an interest in quitting smoking. Akanbi points to the effectiveness of a similar anti-smoking campaign in western nations as evidence it could also work in sub-Saharan Africa. 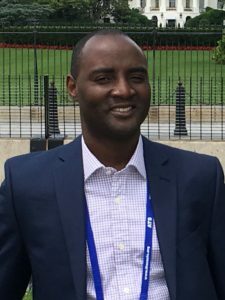 Akanbi is a co-founder of the non-profit organization All Things Health Africa, which plans to introduce these text-based interventions in Kenya and Nigeria.